Amazon India is aiming to take on its archrival flipkart for supremacy in Indian ecommerce space. Both companies are pumping in hot dollars and hoping to outsmart each other. Just like many of you, I’ve been buying regularly from Flipkart since long time and have also made a few purchase from Amazon India. Comparing the services of both, I feel Amazon India is way behind flipkart in overall customer satisfaction. Flipkart has invested heavily in their logistics and is capable of delivering orders almost next day. But Amazon seems to be way behind- way way behind. While flipkart can deliver an order in 2 days, Amazon takes 2 weeks and more. Flipkart provides much more meaningful status update on the order, but Amazon has no meaningful tracking/update. Consider this: I ordered few books on flipkart recently (6th September). Flipkart offered standard delivery by Wednesday, 10th September and express delivery on Monday, 8th Sep if I pay Rs 90 more. I was fine with standard delivery and hence opted not to pay extra. 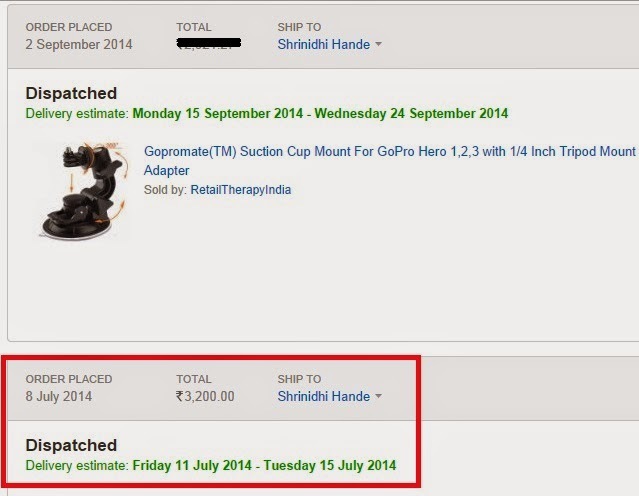 However, the consignment was still delivered promptly on 8th Sep, in under 48 hours. Flipkart’s online tracking is also very effective- I can find out if it is shipped, reached destination city etc. But on the contrary, all my Amazon orders take forever to reach me. (My GoPro order from US reached me faster than a GoPro accessory order on Amazon.in). I ordered a suction Mount for GoPro on 2nd September and 15 days later, still there’s no sign of it. Amazon claims it will be delivered between 15th to 24th September. (They need 9 days buffer- can’t even predict anything properly). I have a feeling that supplier doesn’t have real stock- once customers like me place an order, he will place an order with GoPro.com, get it shipped to him and then ship it to me. If this is the case, they should declare it upfront. I would have placed an order myself directly on GoPro.com, but GoPro website’s 85 $ shipping fee is little expensive for small items. Also Amazon doesn’t seem to have any status other than Dispatched. Even for completed orders, status is still shown as Dispatched. I don’t know when it was dispatched, has it reached my city, where it is now, how much more time it takes… The courier partner in case of my recent order, Bambino express is equally useless. 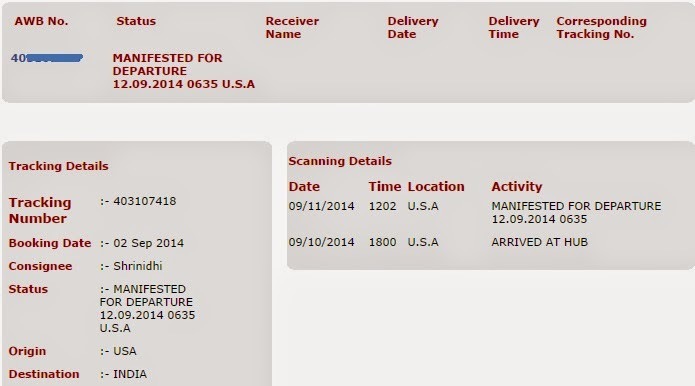 Up to 10 days after the order is placed, tracking status is “Shipment info received, USA”. For past 1 week, the status has been “MANIFESTED FOR DEPARTURE 12.09.2014 0635 U.S.A”. It took full one week just to get packed and shipped out of warehouse and five days since 12-09, there’s no update if it actually departed. Flipkart has a customer care number called out bold in the home page. On Amazon.in, it is a pain to locate a number to call. Even if I call their helpline (they call back on your number), they have no additional information other than the useless status mentioned on the website. Last week, when I called customer support told me order is still with the vendor, while status on website says “dispatched”. I called one more time and second time I was told “the order was shipped on 5th September and you should be getting it asap”. I am just being made to blindly hope. I was offered that an email will be sent to seller to expedite the process. (mail was spent promptly, but sellers reply was again generic and didn’t serve any purpose). Today when I call again, I get an unofficial delivery date of 20th or earlier, but the same doesn’t get documented in an email I receive there-after. I am fine with a delay, but all I want is correct and reliable update- not false promises. When I ask where exactly is the order – is it in US? Has it reached India? 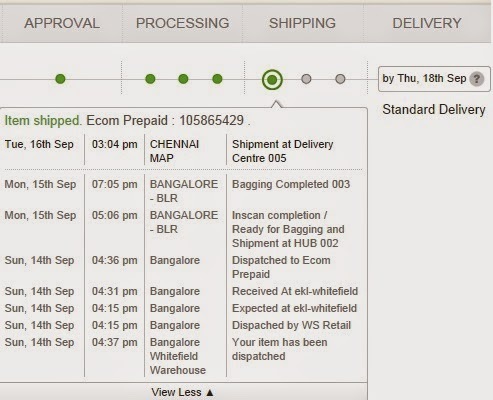 Has it arrived at Chennai hub etc, no one- Amazon, 3rd party seller (Retail Therapy India in this case) and the courier company have any clue as to what is happening. I have a short trip planned for 20th and I am hoping I will get the suction mount before that, so that I can take some good videos. Going by the current rate of progress, I am not really optimistic. My backup plan was to rent a mount from Tapprs (At Rs 50/day), but again I am told they don’t rent the mount alone. I need to rent the camera+ Mount (spending Rs 400 per day) and since they don’t operate 24x7, will have to pay couple of days extra, making the proposition non viable. Earlier I used to compare prices on Amazon and flipkart to decide from where to buy. These days I have stopped looking at Amazon and go there only when flipkart doesn’t have the product I am looking for. Going further, I will first consider all other alternatives before placing an order on Amazon. One of the customer care guys told me that since Amazon.in is less than an year old, they need more time to update the website for effective tracking etc. But I feel these are fundamentals which they should have established even before launch. Also tracking part could have been adopted from their parent website and customized faster. May be the incident is specific to the product I ordered or the seller who has set shop on Amazon.in. Other orders might reach faster. But lack of clear information/real time update and redundant tracking were common to all orders. Also people come to Amazon/Flipkart because of brand name. So these marketplaces should have specific standards/process/checks in place for all sellers on the platform. Those sellers who can’t conform to certain standards should not be allowed on the platform. Flipkart began slow and steady- began with only books, built strong delivery network and gradually scaled up. But Amazon seems to be keen on Big Bang launch of multiple categories, without much of a backbone to track & deliver efficiently. Probably Amazon.in is leaning too much on parent company’s brand name, without making serious efforts to understand how things work in India. Was your experience any better? I completely agree Nidhi. I too had horrible experience with Amzon. Infact i tried to test both simultaneously and was not only disappointed with Amazon but the whole experience was horrible. I ordered a cell phone on Flipkart and mobile cover on Amazon. The handset as expected arrived in 2 days inspire of choosing standard delivery option and the cover arrived in 17 days after frequent follow ups. I know that how Flipkart has WS retail where the goods travel much faster, Amazon has Amazon serviced products so i chose that thinking i should not make a judgement on the basis of one instance. Listen to this: Amazon delivery guy asked me to reach home before 6 as his shift is only till 6 p.m. I came running because i didn't want him to go back. He reached my residence at 6.45 and left at 7.50 pm. Why? He didn't know how to operate the card reader/charger. He was blaming me for paying via card and cash. Amount was Rs 9500, I didn't have that kind of cash at home and i had specifically asked whether they accepted card or not. He kept cursing his machine, called his boss multiple times and kept blaming me for the delay. I asked him whether he is in contract or an Amazon employee? He proudly said "Amazon 'eye". I asked him whether they go through any training. He was clueless. Over all the experience has been all three times horrible. Flipkart is the best. FLipkart has surprised me for good always and Amazon has shocked me with their service. I feel, Flipkart now a days has worst service. Flipkart customer care is nonsense. Quite illogical. I have stopped purchasing from Flipkart. Amazon although says product will be delivered some 14-20 days later, actually its delivered earlier than that. Flipkart service is good and not comparable with Amazon. But prices are bit high on Flipkart and additional shipping charges earlier on books (now a days I wont see additional shipping charges). Even snapdeal is good I felt. My experience too has been similar. Yesterday I chose Flipkart over Amazon while ordering 'Fiction of Fact-finding' (Paperback edition - newly released), though both were offering the book at the same price. I saw similar feedback on Twitter. Tweeps have compared & commented about the delivery dates. Amazon will take some time to settle & take on its more experienced Indian counterpart. I'm a regular customer of Flipkart & appreciate the constant communication- mails & SMS about status of order. Thanks for sharing your experience. W.r.t your refund issue, there is a policy as to within how many days you can ask for a refund. If you've crossed that you may not get a refund. 1 package via Bombinoexp with tracking number 403107870 but still no idea where it gone!! @ Sri tody i filed it. In your case did you get the refund? How many days it took. Amazon rocks. They take one to two weeks maximum to deliver. But there customer service is the best. Plus on a lot of things delivery is free or very cheap. Also pricing is better Dan flipkart. The best part is the refunds. Which is no questions asked. and u get it within 3 working days of them receiving the product. Also they refund the shipping charges. Flipkart reps will call u thief outright if u ask for refund. Or just not refund you anything. Their delivery charges are high but delivery is very fast. Flipkart will not refund for anything. Also their major seller WS RETAIL is owned by proxy (benami) thru relatives of the owners of flipkart. And hence this is fraudulent on FDI rules. But they also give u genuine products. In summary if buying expensive products go with amazon. As dey have very good return policy. If u need small things like clothes books etc. Don't buy stuff more than 7-8000. Because returning and refunding is impossible on flipkart. Thanks for detailed comments Kumar. Yes of late I am noticing that Amazon pricing is always better than Flipkart on most items. Not enough Weekend destinations from Chennai?